2. 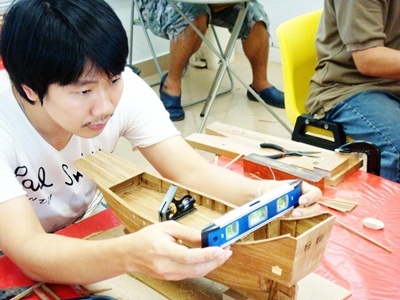 Training Classes in Building Handmade Golden Teak Ship Models. 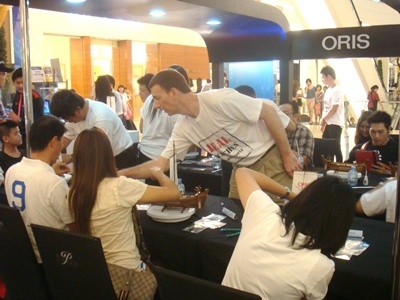 Vision: To build a strong reputation of Thai craftsmanship and be recognized throughout the World in 10 years. 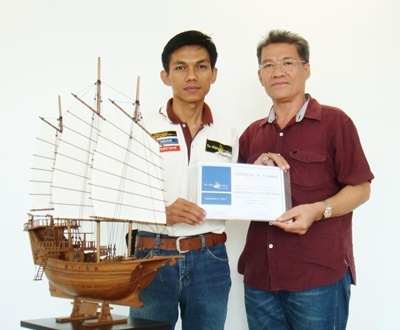 Goal : To present our Thai Craftmanship of Making Golden Teak Ship Models and to be well-known among not only Thai People but also among Tourists which will be able to support Thailand’s Tourism Project. 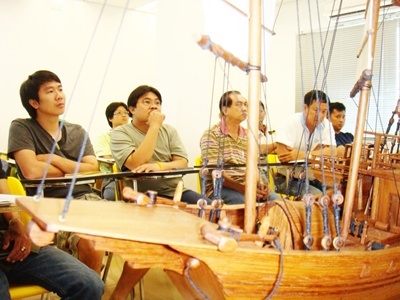 - To open classes for Thai People building handmade Golden Teak Ship Models. 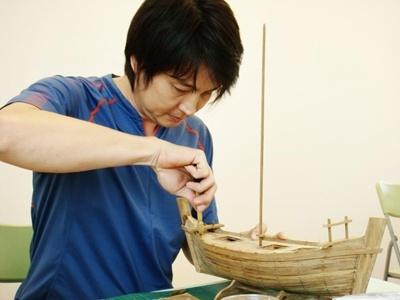 - To open International classes for Foreigners building handmade Golden Teak Ship Models. 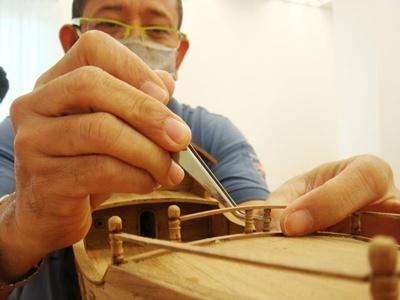 - To open classes for Tourists in Tourist Areas building handmade Golden Teak Ship Models. 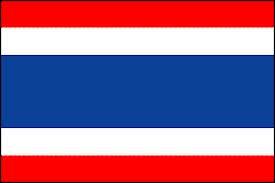 - To develop and present our Thai Handicraft to the Handicraft Center in Asean and the World and become World renown. 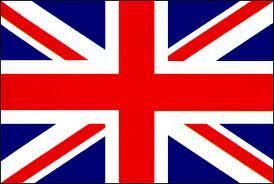 - To participate in numerous activities and present our work to others. 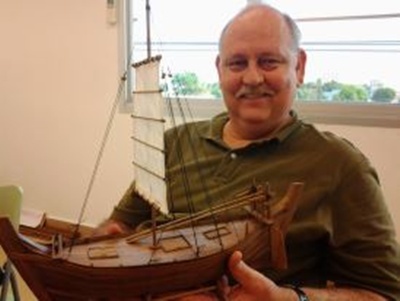 Focus on the basics of building a Golden Teak Ship Model with only 5 tools for new learners in order to go to higher levels. There have been 26 Level 1 Basic courses taught so far with 211 graduated students. 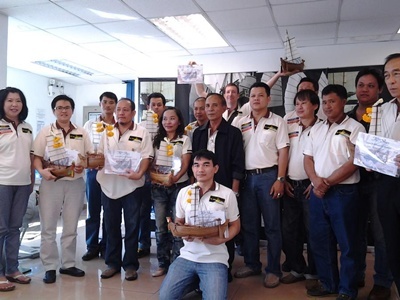 Focus on further skill development of building Golden Teak Ship Models for those students who passed the Level1 Basic Course. There have been 8 Level 2 Advanced courses taught so far with 175 graduated students. Focus on teaching in order to improve building skills for the students who passed the Level 2 course and be a part of producing ship models and being an instructor in the future. There have been 6 Level 3 Professional courses taught so far with 92 graduated students. 1. 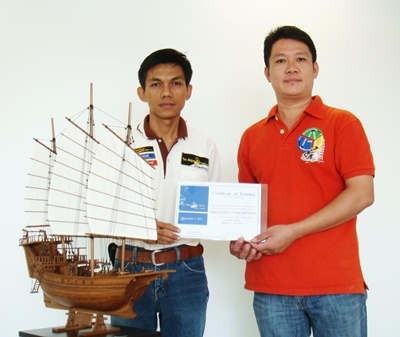 The Ships Gallery was selected and certified by Community Standard in years 2009 and 2012. 2. 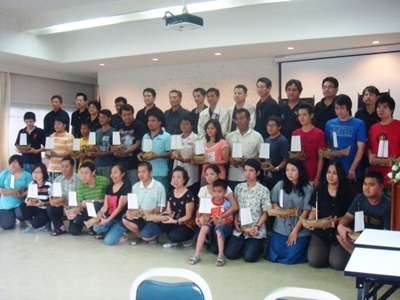 Received the OTOP Product Champion Thailand (4 stars) in Year 2009. 3. The Ships Gallery product was selected by Bumrungraj Hospital to present to Sultan Kabus Bin Said Al Bu Said, The King of Oman. 4. 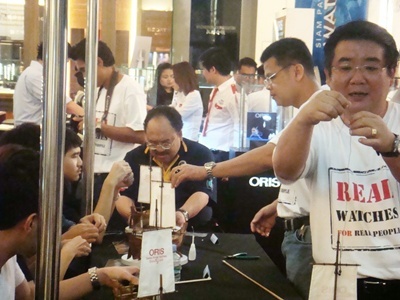 The Ships Gallery was selected by Trocadero Group of Company to create a teaching course for exclusive ORIS clients in order to celebrate The Grand Opening of ORIS model USS Kittiwake Limited Edition. 5. 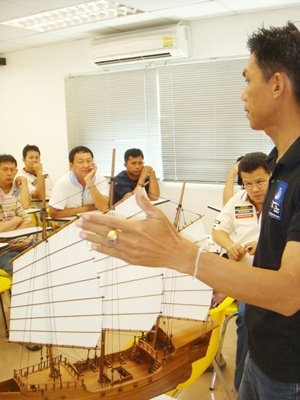 Taught class for building Golden Teak Ship Models to staff from Silapakorn University, Sanamchan Palace branch. 6. 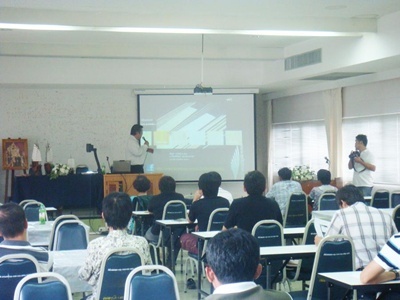 In 2010, the Ships Gallery was a representative of Thailand to present the Golden Teak Ship Model in The Indo-China Exhibition at Pisanulok Province. 7. 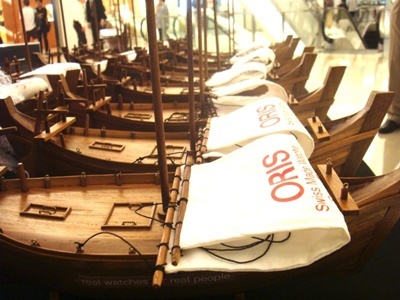 In 2010, The Ships Gallery was invited to present a Golden Teak Ship Model in the 22nd year of The Fishing Exhibition. 8. The Ships Gallery was published in AQUABIZ magazine in the September 2010 issued. 9. The Ships Gallery was invited to promote our institute on the “Economic TV program” on Channel 7 on the 27th of December 2011. 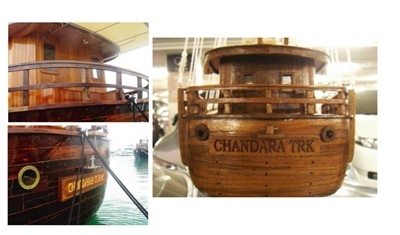 1.Chalom Golden Teak Ship Model, Ratio 1:33, Length 41.90 cm. 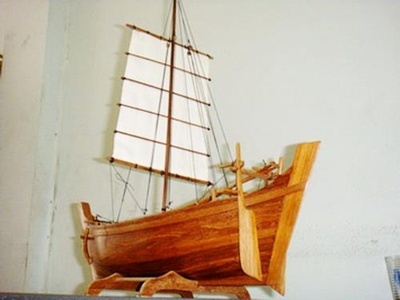 2.Emjuun Golden Teak Ship Model, Ratio 1:33, Length 42.30 cm. 3.1 Ratio 1:70, Length 52.90 cm. 3.2 Ratio 1:50, Length 74.90 cm. 4.1 Ratio 1:75, Length 55.90 cm. 4.2 Ratop 1:50, Length 83.90 cm. 5. 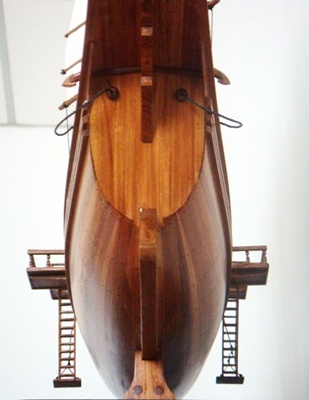 Santa Maria Golden Teak Ship Model, Ratio 1:70, Length 89 cm. 6. 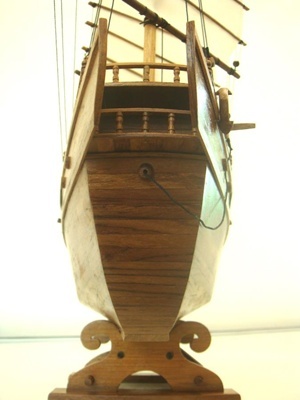 Golden Teak Pirate Ship Model from the movie “Pirates of the Caribbean”, Ratio 1:50, Length 97 cm. 7. 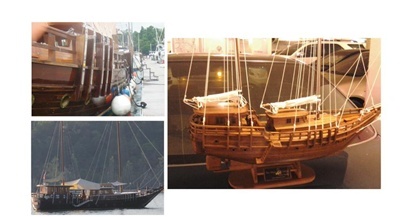 Made to order Golden Teak Ship Models from the Original plans and scaled accordingly to your needs.